Considering the fact that the competition level in the mobile app industry is very steep, there is literally no margin for error. You might have an outstanding idea and have also chosen the optimum features for your app, but your project will only stand out in the crowd if you have also chosen the appropriate technology stack coupled with a unique ideation and other important factors. As such the technology helps in making the project more feasible, scalable and reduces the time and cost of mobile app development. The tech stack influences the process of app development and also creates an impact on the future app updates and releases. So, what do you mean by a technology stack? Well, if we are to define in simple familiar words then it is a comprehensive array of programming languages, interface designing tools, database servers and intruding technologies required to create an app. As such the tech stack is directly going to influence the front-end as well as the back-end development, the development platform, and other aspects that include app security, performance, and robustness. There is no doubt that the native apps are intensely popular both amongst the big business enterprises as well as the startups. This is because they offer various advantages such as comprehensive integration of device, up to the mark user experience, faster performance, high security and best responsiveness. They can make the app more productive and also access the different features of the smartphone devices like NFC module, camera, address book etc. Now let’s discuss the technology stack for popular platforms. First, let’s begin with the Android tech stack. If we talk about the major programming languages used for developing Android apps, they include Java and Kotlin, whereas the toolset is Android Studio. The Java is one of the most dominantly used programming languages in the Android app development sector not only for the mobile apps but even for the web. Java offers developers with a plethora of rich libraries and tools due to its open-source. In fact, giant players Google and Yahoo help in the direction to make this programming language better. However, one of its main cons is that it is very slow and also consumes high memory. But it is regarded as a good technology stack for the project overall as it can handle the complex tasks and is known for its scalability. It is highly recommended to use Java if your team comprises of highly experienced Java developers. Kotlin is a new programming language as compared to Java, which made its worldwide appearance in 2011 and was supported by the Jet Brains Company along with the third-party contributors. However, last year Google announced its full support to Kotlin as the second official Android programming language. It offers stability and congruity to the Android Studio and is suitable for both new as well as the existing projects. What’s more interesting to note is that Kotlin can also be employed in a Java-based project as it is inter-operable. It also offers the benefit of less coding in comparison to Java and has a clear and powerful syntax. The main toolset for Android app development is Android Studio, which is an IDE from Google with support from the Jet Brains Company. Comparatively, it offers more IDE options than the iOS for building the native apps. The Android Studio helps in the editing of the codes, performance tooling and debugging etc. so that the developers can create more valuable and high-quality apps. The Android Developer Tools (ADT) offers extended support for building the native apps. That helps developers in doing specific coding and debugging the tools besides allowing using the graphical UI builder etc. It is important for the developers to download and install every version of the SDK for a specific device that helps to write programs with recent features. The components of the Android SDK are downloaded on a separate note along with the availability of third-party add-ons. The major programming languages for building iOS apps include Objective-C and Swift while the toolset is Apple’s Xcode or Jet Brains AppCode. The Objective-C was one of the primary iOS developing app languages before the arrival of the Swift. However, with the passage of time, its usage has declined as Swift has taken the driving seat. But it is still being employed by a large set of developers for various projects, especially when tacking the complex ones. Also, the other key reasons for using Objective-C are when the project is very large and when the development team consists of highly experienced Objective-C iOS app developers. Ever since its emergence in the iOS family, it has undeniably become one of the most chosen programming languages for the iOS app developers. It is an open-source lightweight language, which has simplified the development process to large extent. It is easy to maintain and allows developers to reuse the code. It also makes the code readability simpler, provides security to the codes, cost-effectiveness and known to offer best-in-class performance. It is for these various advantages that developers today prefer to use Swift in place of Objective-C. The developers commit fewer mistakes while working with Swift, which results in less crashing. As such there two toolsets or IDE (Integrated Development Environment) that is used in the development of iOS apps. They include Xcode and AppCode. The Xcode is said to be the official IDE of the Apple Inc. It is an UI development tool that helps to create native and gaming apps as well publishing it to the Apple Store. In addition, it also supports other iOS platforms such as Apple Smartwatch and tvOS. It also supports other languages excluding Java, C, and C++. The AppCode can be seen as an option to Xcode that is offered by the third-party developer. It also supports various languages and offers faster coding as compared to Xcode. But it provides no other option to Xcode’s Interface Builder that helps to design the interfaces without using codes. The SDK for iOS actually acts as a connection between the software applications and operating platforms with the inclusion of an API. API also includes a number of libraries and tools. The Software Development Kit of an iPhone offers tools for Apple’s touch-screen interface and its proprietary iOS operating system. Both Google, as well as Apple, offer their own developing tools to the developers including the interface elements. The hybrid apps are less expensive in comparison to the native apps and can be used on all platforms. It also provides an access to the API and acquires the device’s camera and storage etc. This is a web-based framework that helps in the building of the cross-platform development apps. Actually, it is the Apache Cordova, which is providing the main strength to PhoneGap; a distribution of the Apache Cordova. But if you want to develop an app, then it is essential to have an IDE supported by a platform such as Android Studio or Xcode. It also has got some features of native apps such as it re-usage of DOM elements to deal with the poor performance of the mobile. It is fast and easy to learn as well. Both Ionic and Sencha Touch receive ample support from the IDEs or the help of plugins. After discussing the technology stack employed for both native and the hybrid apps, we can now shift the course to the discussion on what tech stack is used for cross-platform app development. Usually, the hybrid apps are referred to as cross-platform apps but they are basically websites replicating native apps. Here we need to highlight two technologies that include React Native and Xamarin. It is also cost-efficient and time-saving framework because it provides different tools for debugging and packaging. Apart from that, it is easy to learn for newcomers and allows developers to check how the code works on a screen of the device. The IDEs that support hybrid apps, also lend their support to this framework as well. 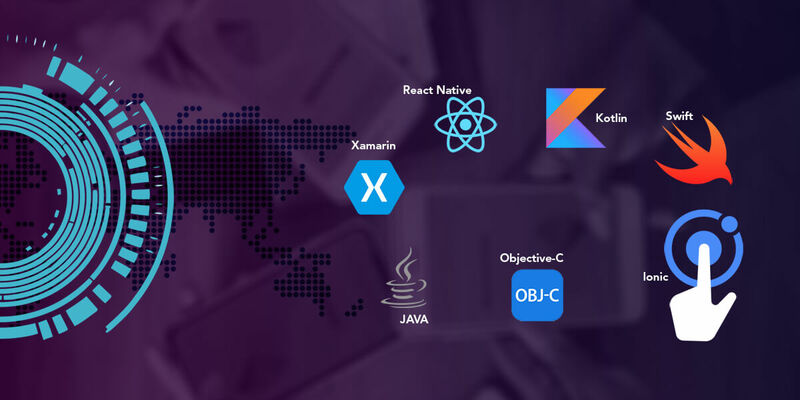 Xamarin is generally chosen as a technology stack for the native cross-platform apps. The developers here can code in languages such as C# or .NET framework. Once the code gets written, it is then compiled with the native UI of iOS or the Android OS. It offers the advantage of developing and testing the app along with checking it in the cloud. It also supports a cross-platform UI toolkit. What needs to be Considered While Choosing Tech Stack? So, far we have thrown considerable light on the different technology stack for native, hybrid and the cross-platform app development. However, you also need to take a note of the vital factors that are important when choosing the technology stack for your mobile app development. It will help in providing the right approach while working on the project with a full-proof plan. This is one of the most important aspects that have to be taken into account. You need to consider the kind of project and its level of complexity. You need to think if you are building a completely customized app with intricate and responsive UI designs. If this is your criteria, it is better to opt for Kotlin and Swift for respective platforms. This is also a crucial factor when you are choosing the technology stack for your mobile app development. You want to check whether your idea is unique or not before starting the project. You would be able to take an appropriate decision of which is suitably the best platform to choose in order to enhance the engagement of more potential customers as well as also fits within your budget estimate. App promotion and marketing is equivalently important if you want to reach a large number of the target audience in less time. Therefore, you have to smartly choose a technology stack that offers maximum benefits as faster development, intrusive and appealing UI design and other customized solutions including integration of social media platforms. The choice of the appropriate technology stack for the app development project is imperative and it needs to be done very carefully. When you are beginning with the project and you have to deal with the tech stack, then choose it wisely after considering the various factors. In addition, you have to take into account the expertise of the development team and your development plans. The tech stack is set to influence the stability of your app along with customer retention. If you are still confused regarding the choice of accurate tech stack please feel free to consult our tech-savvy experts to guide you in your project.